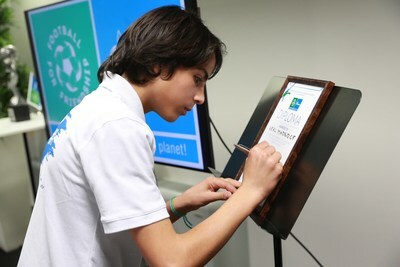 In the course of the meeting, a certificate was signed on the awarding of the Nine Values Cup. The unique trophy will go to Real Madrid, recognized by the project participants as the most socially responsible football club in 2017. The Nine Values Cup holders are Barcelona (Spain, 2015), Bayern (Germany, 2016), and Al Wahda (Syria, 2016), CF Real Madrid (Spain, 2017). In 2018, the Football for Friendship programme unites 211 countries and regions all over the world. Its final events will be held in Moscow from 8 to 15 June and will be timed to coincide with the 2018 World Cup in Russia. "At the moment, the Nine Values Cup is the only sports trophy in the world that is awarded by children. We created F4F as a platform that helps children around the globe make their voices heard, and we are happy to see more than 200 countries from every continent contributing to the project this year. It is heartening to see that supporting F4F has become a good tradition in Italy. Italian youth have participated in the project since 2014, and this season will be no exception," said Viktor Zubkov. «I am very proud that my team has won the Gallini World Cup! It`s a great chance to prove yourself! Right after that match I went to see my mates from the Football for Friendship programme. I am extremely lucky to be the part of such a wonderful project! And I am happy that today I came here to give the award to the CF Real Madrid on behalf of the children of the whole world», said Emmeke Henschen (Netherlands), 15 years old.